The Zebra GK420 label printer provides great amazing value where you have the ability to print wide 4 inch barcodes. Built with Zebra durability and reliability, this versatile direct thermal label printers is ideal for a variety of applications. SKU: N/A. Categories: Desktop Printers, Label Printers. 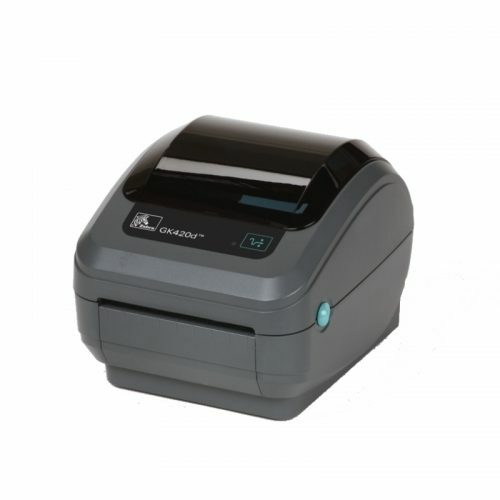 The Zebra GK420 label printer provides great amazing value in the basic desktop printer range. With the GK420 you have the ability to print wide 4 inch barcodes. This versatile direct thermal label printers is ideal for a variety of applications. The G-Series Zebra barcode printers are a compact desktop printer for print widths up to 4 inches, delivering best-in-class speed and performance. From the basic GK™model to the feature-rich GX™model, the G-Series printers are reliable, durable, and flexible to fit almost any low- to mid-volume printing application and budget. These label printers are built with Zebra durability and reliability, the G-Series GK model provides the best value of all basic desktop thermal printers, while the premier GX model supports a variety of industries and applications with the widest range of features. Choose the space-saving direct thermal version of either model for the smallest footprint of any 4-inch desktop printer, or the direct thermal/thermal transfer version to save users time with the easiest ribbon-loading system available. With both EPL™and ZPL® programming languages native on all models, G-Series printers fit in perfectly with other Zebra printers. And a variety of connectivity options makes them easy to integrate into existing local or networked systems. Zebra’s G-Series printers are a smart investment, and always a perfect fit. Retail – Price marking, Gift registry, coupon and receipt printing, Pharmacy prescription labelling.